Unfortunately upon arrival the wind was too high to go and do local area solo flying, but we could skip ahead and do some other stuff. A relatively quick briefing of Precautionary Forced Landings, Precision Landings and the Bad Weather circuit configuration (70 knots, 2 stages of flaps, low circuit height [600ft]). Precautionary Landings (opting to land, typically in a field while you still have power etc. rather then being forced to land when something cuts out), goes hand in hand with the need to do a precision landing – as the name suggests, hitting the aiming point (often referred to for runway landings as “landing on the numbers”). So we’d go out look at the precautionary landing, then come back and do some precision landings and fly some bad weather configuration circuits. Of all the typically used club aircraft, Romeo Charlie always feels the most shiny and new. Taxing out a business jet was doing circuits, sounds like a fun way to spend the day, but for us it meant we got ATC requesting we back track on runway 23 and await clearance. No sooner were we backtracking we were cleared to take off, so just the task of spinning the plane round and opening the throttle (always after a last chance to stop “are you happy?”). Due to traffic, we were requested to exit via the overhead (left turn rather than right, climbing turn up to 2,000ft and then exiting by flying overhead the aerodrome). Climb to 3,000ft……became 3,400ft :-\ Was happily enjoying the flying, hmmm, we’ll go back down. Time to pick a field, after a bit of looking (benefit of precautionary landings), I found a nice big field at 8 O’clock, it was largely into wind and would be hard to miss. Flew a circuit around it, then down to 600ft, initially I was thinking I was aiming to “land” on this approach but actually the aim was to just fly over on this pass (clearly not everything had stuck in the briefing). Looked like a pretty good and big field, no obstacles etc. Another circuit, but now holding 600ft and then a turn on to final, descending, descending….waiting for the call from the instructor to declare it ok and give the “go around” command (can’t fly below 500ft height). 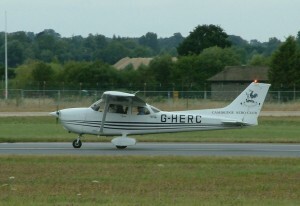 Radio calls were generally smoother then previous few lessons, much happier with the transfers from approach to tower. I don’t read sign language, my instructor was pointing down, down, down……I was happily flying 2,00ft with the crosswind leg approaching (which we should be crossing at 1,000ft). A plane taking off didn’t help the situation as we then had to slot in behind it – only to find it wasn’t staying in the circuit. First precision landing, just too low maybe 200ft to soon, aborted and we’d try that again. My instructor then called to get permission to do a low level circuit (600ft, instead of 1,000ft), she flew it for bad weather, so also much closer (maybe 50% closer) to the runway. Once we turned on to base I was given control. Now to fly my own bad weather configuration, low level circuit. During downwind I was converging a bit to much, but other then that it was spot on and trimmed up @ 600ft and the touch down was even more perfectly on the numbers and even softer on the wheels. Gone are the days of my horrible landings with full flaps and preferring flapless approaches. One more to finish it off. The final approach was a bit oscillating, I went down to three red, one white (bit low of three degrees which is what you sort of want), but that became four red – more power, now it was 3 white one red. Just coming over the threshold a touch too low, meant I was likely to touch down before the numbers, touch of power, a bit of wind and it all converged to result in a thump (by no means the hardest landing I’ve ever had, but relative to the previous two, it was hard). It had to end badly didn’t it, but hey, it wasn’t the worst I’ve done and in this wind, I can’t say I walked away that disappointed really. All in all I was pretty happy with these 55 minutes of flying, the odd point here, a touch of stuff to tidy up there, but a few more boxes ticked and a few really nice landings chucked in for good measure. This entry was posted on Thursday, January 3rd, 2013 at 9:49 pm by PHC	and is filed under Actual Lessons, PPL Course. You can follow any responses to this entry through the RSS 2.0 feed. You can leave a response, or trackback from your own site.